There are numerous reasons for such high physician turnover in Europe and the U.S. Already at the outset, at the phase of recruiting and onboarding, there are many things that can go wrong. Given that there is a shortage of doctors, physicians are high in demand yet are usually careful to pick where they will be working, since this often means they will have to relocate. Relocation creates significant changes to their personal lives and schedules, and carries an upfront burden which recruiters must be able to compensate for with adequate programs inside the hospital. Yet, doctors don’t quit their job or move on to another one due to money or location. While these are important factors that play a role, it has repeatedly been shown that what makes doctors want to quit their job most is bad hospital practices and burnout. Time-consuming, nerve-wracking activities and stress are a much greater hazard to doctor retention than are location or pay (if these are, of course, agreeable). By definition, doctors are value-driven people that thrive to a great extent on the satisfaction that comes with helping others. And in that sense, every hospital is only as good as the quality of its service. That, in turn, depends first and foremost on the state of mind of its doctors. This is why hospital managers need to understand what it is that negatively influences doctors the most and learn to address these issues in a consistent and efficient way. Surgeons in particular are a special group of doctors. This is not to say that other professionals can or know less, but that not simply everyone is fit to be a surgeon. And as each group of doctors need to have their needs understood and met, there are things that need to be done for surgeons in particular. The key question for hospital managers to ask themselves is how hospital culture satisfies surgeons’ career and personal needs. One key practice to retaining surgeons is staff engagement. 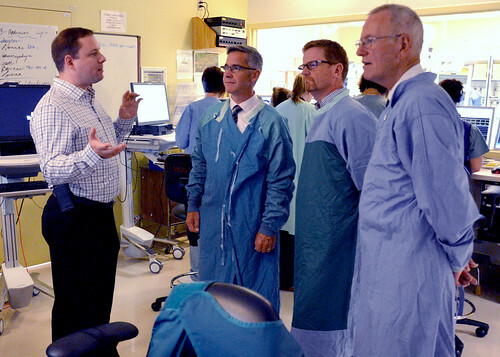 Since surgeons tend to often assume a ‘lone wolf’ type of mindset and bear the difficulties of their profession in an isolated way, it is of great importance to involve them consistently in the hospital community and culture. Surgeons should be involved alongside managers in the decision making process which concerns their own practice. After all, they are the ones to experience the mistakes, vulnerabilities and inefficiencies. Besides, involving them has the two-sided benefit of engaging them and acknowledging their needs, as well as improving working conditions. 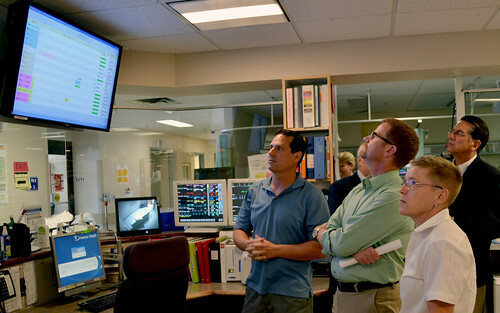 For example, operating room turnaround time has been shown to both create significant delays as well as raise costs. Not only that but it also increases overall surgery time, which is a major contributing factor to surgeon stress. Creating a team to work on issues like these and keeping everyone involved to various degrees strengthens workplace connections and helps retain staff. Apart from managing processes, hospital managers would do well to consider making surgeons’ workplace environment as optimal as possible. While this can have an upfront cost that may seem too big, the benefits, economically speaking, outweigh the costs in the long run. Enhancing the workplace and the operating room contributes to surgeon retention. Innovative healthcare technology is one possible solution to this challenge. An example of that is hands free computer interaction technology to be used in the operating room. By using such technology, surgeons can significantly reduce the duration of an operation and with that a lot of costs and risks. In turn, that can help relieve both physical as well as mental and emotional stress for them. Surgeons can further plan the operation in a more systematized manner and make use of their planning during the operation. This is possible through an integrated system that permits for the use of patient data right on the spot. That way, other risks, such as surgical-site infections are also addressed and eliminated, as surgeons don’t leave the sterile environment. Therefore, instead of cutting surgery department costs, hospital managers should carefully consider the cumulative benefits of upgrading their technological base, in the light of surgeon retention and overall well-being. Last but not least, with the discomforts of relocation, come a lot of bumps in the road of one’s personal life. Surgeons especially can suffer from a great deal of emotional and mental hardship, which inevitably ends up influencing their personal lives. This is where HR skills are crucial and why these need to be based on an overall retention program that is continually developed and monitored. Such a program needs to take into account the personal needs of surgeons and their families, and address these in a timely manner. Such a program also needs to distinguish between the needs of early-, mid- and later-career surgeons, for example, in order to address these adequately. As an additional aspect to recognizing the needs or potential issues of surgeons, active and open communication must be developed. A managerial quality which is needed everywhere is one which addresses and listens to employees’ needs in a proactive way. Soliciting frequent feedback from surgeons or surveying them on a semi-yearly or yearly basis concerning their satisfaction with the workplace and their career is one such way to foster communication. Further incentives may come by way of documenting and rewarding clinical performance, through employee recognition programs. Surgeons are expected to consistently demonstrate high engagement and performance – and naturally so, since their job is a demanding one. Therefore, they should not be left without tangible rewards for keeping a good record – such as competitive wages and benefits packages. Nor should they be left without support in cases of surgical complications, which have strong effects on psychic well-being and can leave many a surgeon seriously affected. Other benefits should come along in the form of continuing education which allows surgeons to develop their professional or soft skills and grow. From mentoring programs to working with academic institutions and partnering organizations, exchanging experience is very relevant and important for surgeons. How Do You Care for Your Surgeons? It can’t be stressed enough how important it is to consistently care for your staff. Retaining your best surgeons and creating an overall supportive environment is not only key to high hospital revenues but, more importantly, to high-quality patient care. As a hospital manager what is it that you do to retain your surgeons? Which are the practices that have worked and which are the ones that don’t? Leave us a comment!